Photosynthesis is the name of the process whereby organisms convert light energy from the sun into sugar and other organic molecules. They can then go on to use these substances as chemical energy, in the same way, that humans use food. Photosynthesis is essential for almost all life on earth. Organisms that undergo photosynthesis include green plants, phytoplankton, and cyanobacteria. Most of what we will discuss surrounds green plants, which are the most common photosynthetic organisms in land ecosystems. Most organisms rely on photosynthesis for nutrients, either directly (plants) or indirectly (by relying on plants as an energy source). Organisms that undergo photosynthesis are called photoautotrophs. Photoautotrophs sustain themselves by synthesising their own food from carbon dioxide and other raw materials, and are referred to as the biosphere’s “producers”. In contrast, heterotrophs sustain themselves by relying on the material produced by other organisms and are referred to as the “consumers”. Humans are an example of heterotrophs. Photosynthesis is key for introducing energy into the ecosystem. It also removes lots of carbon dioxide from the atmosphere and produces oxygen for cellular respiration. The site of photosynthesis in green plants are the leaves. Cells are able to carry out photosynthesis because of structures termed chloroplasts, which are the centre of the reactions. Chloroplasts are specialised membrane-bound organelles found only in plants and some types of algae. Each cell may have up to 200 chloroplasts. Chloroplasts are usually spherical or disc-shaped organelles in higher plants and are found in the cytosol of the cell. Chloroplasts contain a pigment called chlorophyll, which absorbs the light energy driving photosynthesis. It is chlorophyll that gives chloroplasts their green colour. Chloroplasts have an inner and an outer membrane often referred to as the chloroplast envelope. 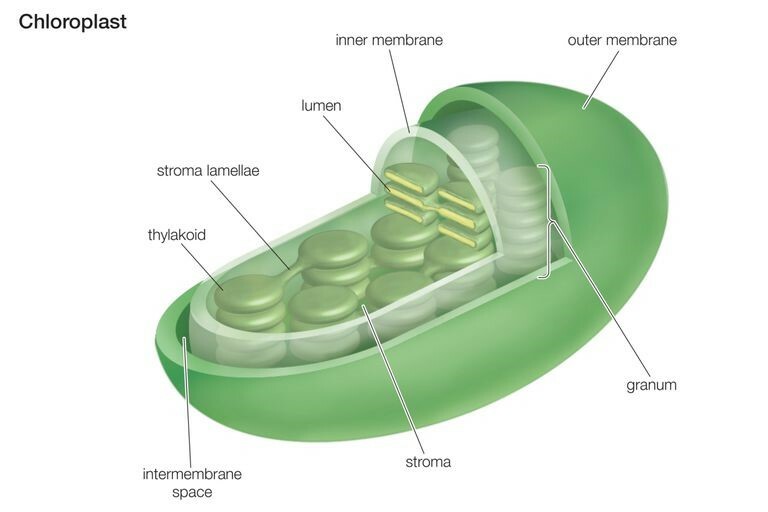 Inside the chloroplasts, there is a protein-rich substance called the stroma. Within the stroma, there is a second membrane system called the thylakoid membrane, which consists of disc-shaped sub-structures, arranged into stacks called grana. A single granum comprises around 20-60 thylakoids. The thylakoids contain light-harvesting complexes and photosynthetic pigments (i.e. chlorophyll), and it is here that the initial reactions of photosynthesis take place. The reactions of photosynthesis can be divided into two steps: (1) the light-dependent reactions and (2) the light-independent reactions (also called the Calvin cycle). In plants, the light-dependent reactions occur in the thylakoids of the chloroplasts, where chlorophyll is found. When light energy from the sun reaches the pigment molecules, it energizes the electrons within them. These energised electrons are pushed to an electron transport chain within the thylakoid membrane. The steps of the electron transport chain harness energy from the electrons by producing NADPH from NADP+, and ATP from ADP. Concurrently, water molecules are split to produce hydrogen and oxygen, releasing electrons to replace the lost electrons in chlorophyll. Oxygen is released as a by-product of these reactions. 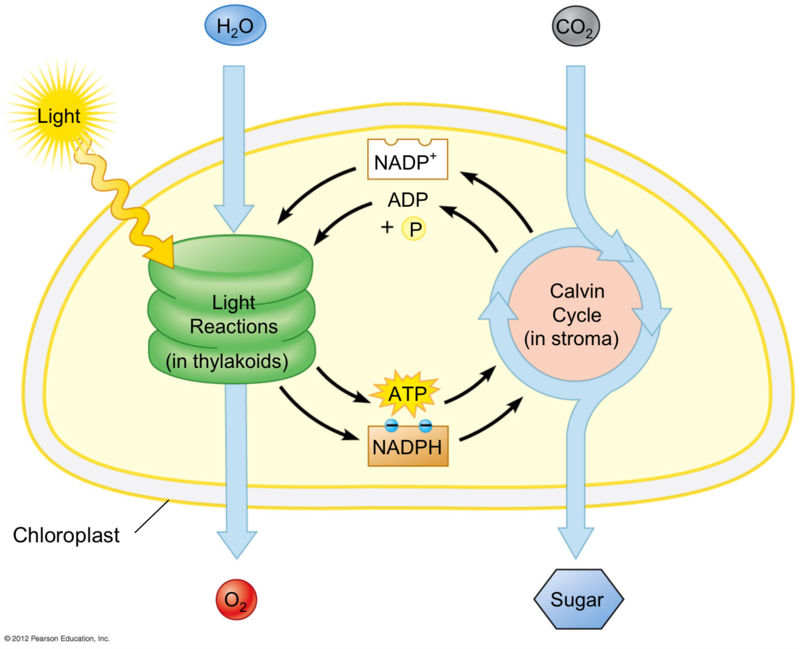 Light-independent reactions following the light-independent reactions in the thylakoids, the light-independent reactions, also called the Calvin Cycle, take place in the stroma of the chloroplasts. Carbon dioxide from the atmosphere is incorporated into the compounds already present in the chloroplasts in a process termed carbon fixation. Energy from ATP and NADPH produced in the light-dependent reactions is used to drive reactions in which carbon (from carbon dioxide in the atmosphere) is used to synthesise a three-carbon sugar called glyceraldehyde-3-phosphate (G3P). G3P provides the basis by which cells can build more complex carbohydrates and other organic molecules. Photosynthesis is a light-mediated redox reaction. In plant photosynthesis, light energy is used to split water into the energy of light is used to split water, transferring the electrons to carbon dioxide which is used to generate organic products.
. Campbell, Neil A., and Jane B. Reece. Biology (8th Edition). San Francisco: Benjamin Cummings, 2007.